Here is the new large-format piece, entitled The Warming. I will hopefully get the three new works out for a print test this week to see how accurately the colors will translate, which is pretty crucial given how long I spend picking the right hues. I worked hard on this new piece to keep a level of androgyny about the figure. My previous attempts all have an obvious gender involved, so it was a nice change to bring that element out and leave it to interpretation. 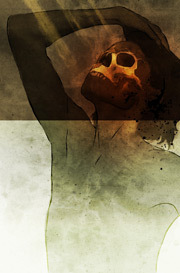 There is a detail shot of the skull posted to show a bit of my digital paint at work. I like choosing colors, but I’ve noticed with these pieces in particular I always tend to lean toward a warm spectrum. I use lots of red, orange and yellow ochre throughout the entire process because it feels pretty natural to me. For that reason I am trying to steer my work away from that color palette to use more greens and blues. More to come later this week as I’m trying to organize a few more photo shoots. An icy blue/gray/turquoise combos to theses skull themes may look quire nice. But I’ve always preferred earth tones and warmer hues. I find something archaeological and primitive with these pieces, the textures, the browns, the dirtiness of it all make it seem like the unearthing of a corpse from a village buried under a lava flow.